Regular readers of Visions of the North will recall my older posts about the silver utensils -- one spoon in particular -- that played such a key role in the launching of the Schwatka expedition; the story is also told at greater length in Chapter 8 of my Finding Franklin. And yet now, I've discovered quite a new and different chapter of that story, and found a trail of "clews" that stretches all the way from Arctic Canada, to New York, Milwaukee, and eventually to the Channel Island of Jersey, where one of Potter's forks unexpectedly turned up at some point prior to 1936. The story begins with Captain Edwin A. Potter, late master of the New Bedford whaler "Glacier," who in 1873 returned from two winters in the Arctic with a handful of silverware that had a tale to tell. Captain Potter might not have been the best observer -- he thought that Franklin's crest on his spoons resembled an Indian with a bow and arrow! -- but he did realize that what he had obtained were relics of the Franklin expedition. Two large spoons of Sir John's -- one with the famous copper mend -- were the stars of the show, but their impact wasn't felt until a few years later, when Thomas Barry brought them to the attention of the American Geographical Society (Barry claimed he'd received the spoons from the Inuit; Potter claimed he'd stolen them from him). As I recount in my book, the spoons were eventually returned to Sophia Cracoft (not, by her account by Thomas Barry as he'd claimed, but only when the whaling company that employed him demanded them back, from whence they went to the US Naval Observatory, and then to Miss Cracroft). But what of the others? What, especially, of the fork with the initials "R N" scratched into it, which Potter thought might mean "Royal Navy" (though that would be odd, as in every other instance the initials were those of one of Franklin's men). A few days ago, looking for better imagery of the silverware of Henry Thomas Dundas Le Vesconte, I noticed, via a footnote in my friend Huw Lewis-Jones's article about him, that there was a fork of his in the collections of the Société Jersiaise. That esteemed entity, now a part of Jersey Heritage, had an online database of its collections -- but alas, no fork was listed. 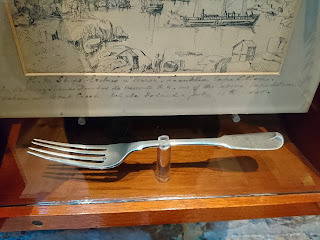 Hoping against hope, I wrote to them, and received a very kind reply, with the photo above, confirming that they did indeed have such a fork, whose ownership was attributed to Le Vesconte (whose family was from Jersey). The museum, alas, had no provenance for the fork; it first was mentioned in their records in 1936. 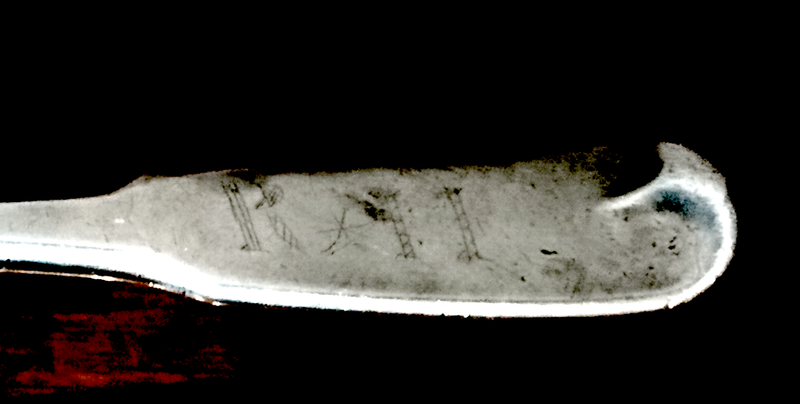 But in any case, there, scratched onto its upper surface, were letters that looked very much like RN, or perhaps RM, or RII -- it was hard to be certain, but only one fork was said to have had similar marks -- that of Captain Potter. The line of transmission was very unclear, however. 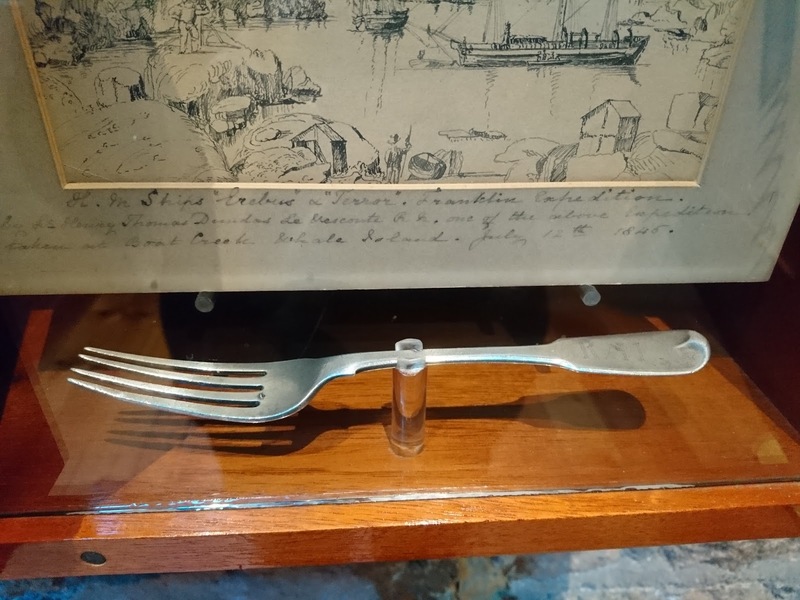 If this fork had been Potter's, how had it found its way across the ocean to Jersey? It was then that I searched the archives of the American Geographical Society (now in Wisconsin), which had sponsored Schwatka's expedition, and found a very curious item. It was, in part, a typed copy of an undated newspaper article, under the headline INSANE. Captain Edwin A. Potter, formerly of this city, but for a couple of years past a resident of Westport, has been adjudged insane, and was taken to the asylum at Taunton yesterday by Deputy Sherriff Kirby. Capt. Potter sailed for many years from this port in the whaling service, and at one time commanded the bark Glacier in the Hudson Bay fishery. Above is a copy of a clipping lent to us by Mr. Wood of the American Numismatic Society, accompanying two forks, two large spoons, and one small spoon. They were returned to Mr. Wood on November 18, 1930. 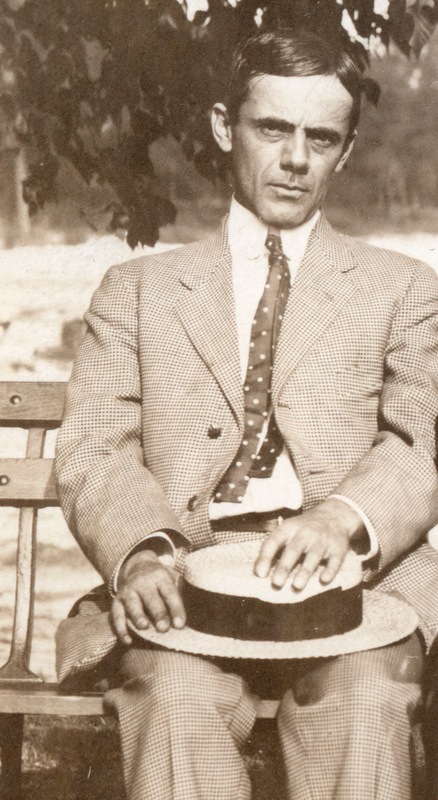 "Mr. Wood" was doubtless Howland Wood, the longtime curator of the ANS. But what would he be doing with Potter's spoons and this newspaper clipping? I can only assume that, at some point near the date of this note, Captain Potter's effects had been brought to his attention, possibly via a pawnbroker or someone managing an estate sale. He was born in New Bedford, so news of the story would have been local knowledge. In his search to identify the utensils, he'd found (or been given) the clipping, and had sent the items to the AGS for assessment, or advice. If it was advice he'd sought, I feel confident that they would have recommended they be returned to the the families of their late owners, and that it was by this means that the fork attributed to Le Vesconte arrived in Jersey prior to 1936. But there is yet more to the mystery: the fork, like those at the National Maritime Museum, has only been photographed from above; with this style of cutlery, with a ridged top, the crest is generally etched on the underside, along with the maker's hallmarks. I'm waiting to hear what the good people of Jersey Heritage uncover; they have taken a great interest in my findings, and plan to have the fork removed from its case and photographed on both sides. I'll follow up here with a fresh posting as soon as the results are in. It's perhaps not unexpected that, just as news stories about the machinations over 2016 permits for Franklin searches have been gaining widespread attention, that a new study by a key group of land archaeologists has made its appearance, and that Doug Stenton is its lead author. We've known for some time that DNA analysis was contemplated for human skeletal remains -- the possibility was mentioned in an earlier article co-authored by Stenton on the facial reconstructions of two skulls from among these bones, and Stenton talked publicly about this aspect of his work at the Royal Ontario Museum last year. And yet now that the initial article is out, there are a number of surprises -- some small, some large -- about what this new evidence reveals. Even though no matches have as yet been made with living descendants of Franklin's men, the DNA results -- including samples from two hitherto untouched sites -- are pretty remarkable. The world press, perhaps predictably, has seized upon the fact that four samples came back with values consistent as female, one of them from a mandible collected at NgLj-2 much like the one shown here. Despite the caution in the paper that these results were preliminary, and in two of the four instances counterindicated by other factors, the ever-reliable Daily Mail has come out with a headline Mystery of the Doomed Franklin Expedition Deepens: Some of the sailors were WOMEN. But it's the other revelations of the study that are far more significant in terms of our understanding of the last days of Franklin's men. For one, it reveals that in 2016, work was done both at Booth Point (NcLa-1) and on the Todd Islets (NcLa-5), two sites that many Franklin scholars (myself included) had long urged be examined. The archaeological work itself received no public notice, and thus this paper is the first indication it was undertaken. In addition to these new sites, 32 skeletal elements from Erebus Bay sites were brought back from the cairn there by Doug Stenton and used as sources for DNA samples; the results increased the (minimum) number of distinct individuals represented at NgLj-2 from the original range of 8-11 to 13, along with 10 further distinct individuals at nearby sites -- a significant difference. We must now regard Erebus bay as a site from which a substantial percentage of Franklin's men -- nearly 18% -- never escaped. Beyond that, the Booth Point/Todd Islets site yielded a reading of one individual at the former, and two at the latter (where five individuals had previously been reported, based on the number of skulls). But even as this evidence brings us much fresh insight, it also reminds us of how new knowledge connects with old. The study observes that, at the Todd Islets site, human bones were "commingled with a similar number of caribou bones." 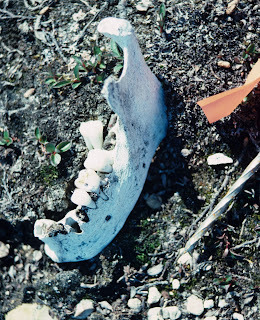 But this is not a surprise; as I mention on page 73 of my book, the Inuktitut name of the place -- qiunak -- means "the place one can starve to death," but according to local tradition the ones whose starvation gave the place its name were caribou, not men. It's to be hoped that all this valuable DNA data will soon be able to be compared with samples from living descendants, direct or collateral, to see whether a positive identification can be made. I know that, both in the UK and around the world, there have been efforts to help locate such individuals, and there is generally an eagerness to come forward among them. I'm sure that Doug Stenton and his colleagues are already following up on this, and hope and expect that in the course of their search, resources such as the "Remembering the Franklin Expedition" Facebook page -- whose members include folks with names like Goodsir, Crozier, Collins, and Hodgson -- may help expedite it. Thanks to the diligent detective work of Steve Ducharme of the Nunatsiaq News, we now know a good deal more about the Franklin searches of the summer of 2016. Some of what he's uncovered is simply the inevitable back-and-forth between the agency charged with issuing archaeological permits -- the Culture and Heritage department of the Government of Nunavut -- and those seeking such permits, whether the underwater archaeologists of Parks Canada, or those working on sites on land, such as the recently-retired director of that department, Doug Stenton. And yet the case has, as Sherlock Holmes used to like to say, "several point of interest," meaning that not everything may be as it may seems. This is especially true with regard to the activities of the Arctic Research Foundation which, since it isn't an agency of the government, is not subject to laws requiring the disclosure of information to the public. The first major takeaway is that the GN's Heritage division did two odd things in the same season: it approved a permit for Doug Stenton to do land-based archaeological work in the Terror Bay area, and it issued a specific restriction preventing the Parks underwater team from listing Terror Bay as a fallback search area, should their primary search area in Victoria Strait prove inaccessible. The language was surprising: "Terror Bay is not approved as an alternate survey site. There is no historical, oral historical, or archaeological evidence identifying Terror Bay as a possible location for one of the Franklin wrecks." In hindsight, of course, this sounds foolish, but even at the time it's a bit odd. True, prior to the 2016 discovery no one had singled out Terror Bay as a specific location for one of the ships -- but no one had excluded it either. Some known points -- the existence of a "Tent Place" on the shore there, the discovery of a crumpled metal tank by Patsy Klengenberg's wife in 1931, suggested the presence of some vessel in the vicinity, at least for a time. Even back in 2010, before either ship had been found, I wrote in this blog that "we can suppose that they (Erebus and Terror) were trapped again, and one of the vessels crushed, in either Erebus Bay or Terror Bay, or both." So I think it's wrong to have claimed there was no evidence as to a ship in Terror Bay -- as with many aspects of the Franklin story, there was indeed evidence that, in retrospect, can be seen as having pointed there -- the key factor seems to have been Stenton's plan to do work on land at the site. Perhaps he hoped that, as had happened in 2014 when his helicopter pilot Andrew Stirling had spied what turned out to be part of a ship's davit, a discovery on land would once again point the way to a still greater one underwater. 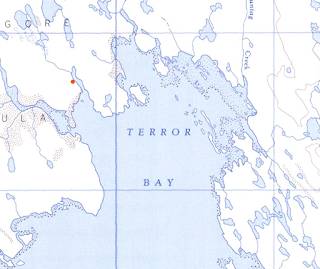 The language of his application -- “Time and weather permitting, an aerial search will also be conducted in eastern Terror Bay in an attempt to locate a sunken vessel reported at the location by Inuit” -- suggests that he was being disingenuous at the very least. One wonders whether these Inuit reports were the ones of today, or from older testimony. Could Sammy Kogvik's account have been known about before that summer? No person, other than a person engaged in a search and rescue operation, shall dive, or approach with an underwater submersible, to within 30 m of an archaeological artifact without a Class 2 permit. And yet ARF's own video, made after an earlier camera rig had snagged on the wreck and been lost, not only shows that they went much closer, but actually penetrated within the vessel. We may, as have many who've written about the discovery of HMS Terror, happily credit Inuit accounts, as given by Sammy Kogvik, for this fortuitous find. We may revel in what the video shows us, and thrill at the discovery of the ship in such extraordinary condition. But a discovery that deliberately flouts the law is a danger to all discovery; it opens the wrecks of Franklin's ships to prodding by any party who thinks they can get away with it, as ARF did. ARF furthermore hid the discovery from its partner -- indeed, given the permit was issued only in Parks's name, its supervisor -- for eight days at least, giving an exclusive version of of the find to photojournalist Paul Watson, who then sold it to The Guardian. Keeping the people under whose permit they were to have worked in the dark, and probing a sensitive wreck with no supervision from trained archaeologists, would seem to be a fairly clear-cut case. ARF's belated claim that there was no "updated protocol" for 2016 makes no difference -- if there was indeed no such protocol, they should never have been participating in the search at all. Despite all this, it's my hope that, as this summer's search approaches, we can all once more get back to the fundamental fascination with the Franklin story that drives all of us who have encountered it. I hope that the new agreements between Parks Canada and key Inuit organizations will make these new finds more readily available, and will increase the benefit to local communities. I hope that those who work on land, and those who dive below the waters, will come to see that each side possesses a part of a symmetric puzzle, both of which will be required to fully understand it. And, above all, I hope that both of Franklin's ships will be effectively protected from those whose lack of care and knowledge may damage the vital evidence these almost sacred vessels have preserved within their oaken hulls for more than a century and a half.